The numbers for x, y, and z are the coordinates (a coordinate is also known as a direction or an axis) of the position. Need to visualize x, y, z? Try the 3D Axis example to see the x, y, z axes. Need to know where East, West, South, North are pointing to? Try the compass to visualize cardinal directions. There are two kinds of positions: a relative position and a world position. A relative position has ~ before each number and is centered on the player’s current position: (~0, ~0, ~0). Players are two-block tall, so it is important to note that the position (~0, ~0, ~0) corresponds to the player’s feet. Because relative positions start from where the player’s feet are, relative positions aren’t fixed in the world - they “move” with the player. For example, the relative position (~0, ~2, ~0) will always correspond to the block that is currently above the player’s head, no matter where the player is in the world. If the player moves, then (~0, ~2, ~0) is no longer at the same block as before the player moved. Keep this in mind when using relative positions in your code! You can create a relative position using the ||positions:~0 ~0 ~0|| block. The position of the player’s head is 1 block above their feet, its relative position is (~0, ~1, ~0). The position of the block 1 block East of the player is (~1, ~0, ~0). The position of the block 2 block West, 5 blocks down of the player is (~-2, ~-5, ~0). A world position is 3 numbers that are the distances in each direction from the world origin: (0, 0, 0). This is also called an absolute position. World positions aren’t changed by the player’s current position. They always stay the same. For example, the position (5, 2, 15) will always mean the same block in the world, no matter where the player is. 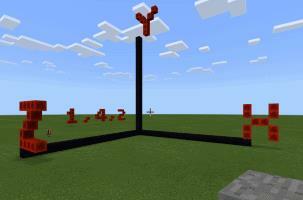 You can create a world position using the ||positions:world 0 0 0|| block. Enter /position in Minecraft to see your current world position in the top left corner of Minecraft. You can also use the ||player:player world position|| block in your code. This way, no matter where you are in the game world, your code can use your position to do things near you. You can add two positions to create a new one.